A 5 1/2-length wire job in the Ashland Stakes (G1) at Keeneland on April 7 helped propel Monomoy Girl into 2-1 favoritism when the post positions were drawn Monday for the $1 million Kentucky Oaks (G1) on Friday, May 4, at Churchill Downs. The Brad Cox-trained daughter of Tapizar was making only her second start of the year in the 1 1/16-mile affair, but dominated that day as the 1-5 favorite. It was her first race since kicking off her sophomore campaign with a 2 1/2-length score in the Rachel Alexandra Stakes (G2) at Fair Grounds on February 17. 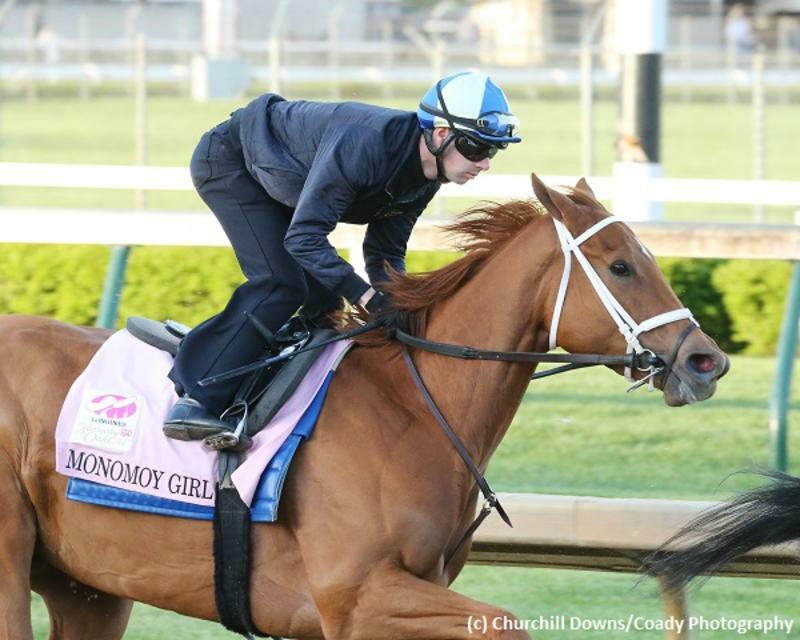 Monomoy Girl has experience over both the grass and dirt surfaces at Churchill Downs. After breaking her maiden on the turf at Indiana Grand last September, she shipped to Churchill and wired an allowance/optional claimer on the sod. Transferring to the main track for her next start, the chestnut lass led gate-to-wire for a 6 1/2-length triumph in the Rags to Riches Stakes under the Twin Spires in late October. She suffered her only loss to date when missing by a neck in the Golden Rod Stakes (G2) on November 25, which concluded her juvenile season. Jockey Florent Geroux has been aboard for all but Monomoy Girl’s career bow and retains the mount in the Oaks. Midnight Bisou made her case for favoritism in the Kentucky Oaks with a rallying 3 1/2-length win in the Santa Anita Oaks (G1) last out on April 7. The Bill Spawr trainee began her career with a pair of nose seconds at Santa Anita and Del Mar, the latter in the Desi Arnaz Stakes, before breaking her maiden while making her three-year-old debut in the Santa Ynez Stakes (G2) at Santa Anita by 4 1/2 lengths. The Midnight Lute filly followed her January 7 seasonal bow with a 2 1/4-length score in the Santa Ysabel Stakes (G3) while stretching out past seven furlongs for the first time. She then showed up in the Santa Anita Oaks and romped under returning jockey Mike Smith. Dubai shipper Rayya is something of a wild card in the Kentucky Oaks, though there is no doubt about her talent. The chestnut daughter of Tiz Wonderful romped by 9 3/4 lengths in her debut at Meydan in early December and just missed by a nose in an allowance to kick off her sophomore campaign on January 18. Trained at that time by Doug Watson, the Kentucky-bred miss filled the second spot again, this time in the U.A.E. One Thousand Guineas, before scoring her first stakes win with a 3 3/4-length victory in the U.A.E. Oaks (UAE-G3). She impressed so much on that occasion her connections entered her against the boys in the U.A.E. Derby (UAE-G2) last out, where she finished second behind runaway winner and Kentucky Derby (G1) contender Mendelssohn. Rayya was then shipped to the United States and transferred to trainer Bob Baffert, who has tabbed Drayden Van Dyke to ride the filly in the Kentucky Oaks. Wonder Gadot was recently honored with a Sovereign Award as the Canadian champion two-year-old filly thanks to a pair of scores in the Mazarine Stakes (Can-G3) at Woodbine and Demoiselle Stakes (G3) at Aqueduct. That latter contest came over the same 1 1/8-mile distance as the Kentucky Oaks, and the Mark Casse pupil will try to parlay that experience into victory on Friday. The Medagalia d’Oro filly has yet to find the winner’s circle in four starts this season, but came close on two occasions when a neck second in the January 13 Silverbulletday Stakes at Fair Grounds and a nose runner-up in the Fantasy Stakes (G3) at Oaklawn Park last out on April 13. John Velazquez has been aboard Wonder Gadot for all but her last start and takes back the mount on Friday. Chocolate Martini rides a two-race win streak into the Kentucky Oaks with Javier Castellano in the irons for the first time. The Broken Vow filly earned her initial victory against maiden claimers and was claimed out of her next start, a fourth-place run at Fair Grounds in early February. Trainer Tom Amoss took over from Bret Calhoun and Chocolate Martini responded with a neck score against allowance/optional claiming rivals just 16 days later. She made her stakes bow next out in the Fair Grounds Oaks (G2) and just got up for the head score to earn her shot at Kentucky Oaks glory. Besides Wonder Gadot and Rayya, My Miss Lilly is the only other runner in this field with prior experience at or beyond the nine-furlong Oaks distance. The Mark Hennig charge gained that experience last out on April 7 in the 1 1/8-mile Gazelle Stakes (G2) at Aqueduct, scoring a half-length win under race rider Joe Bravo. The gray daughter of Tapit was third in a pair of stakes prior to that, the Forward Gal Stakes (G3) at Gulfstream Park and Busher Stakes at Aqueduct. Much was expected of Eskimo Kisses following an 11-length allowance/optional claiming score at Oaklawn Park in late February, but the Kenny McPeek trainee has failed to find the winner’s circle in two tries since. She didn’t do badly, finishing runner-up in the Ashland and second by a head in the Fair Grounds Oaks (G2), and could rebound in a big way here under Corey Lanerie. Like Eskimo Kisses, Classy Act is still looking for a first stakes win. The Calhoun pupil has run second in the Rachel Alexandra and a close fourth in the Fair Grounds Oaks thus far. In the Kentucky Oaks, the Into Mischief lass gets the services of Brian Hernandez Jr., who piloted her to a maiden win and allowance/optional claiming victory earlier this season. Sassy Sienna and Coach Rocks bring wins into the Kentucky Oaks thanks to respective scores in the Fantasy and Gulfstream Park Oaks (G2). Trained by Brad Cox, Sassy Sienna is the most experienced runner in the field with nine races already under her girth. The Midshipman miss gutted out a nose score in the Fantasy under returning jockey Gary Stevens. Coach Rocks parlayed an eight-length maiden victory into a 1 1/2-length win in the Gulfstream Park Oaks. Luis Saez was aboard for both those efforts and the duo will be trying for a third straight together on Friday. Take Charge Paula has gone 3-1-2-0 since being transferred from trainer Kelly Breen to Kiaran McLaughlin for her sophomore campaign. The Take Charge Indy filly captured the Forward Gal and filled the second spots in the Davona Dale Stakes (G2) and Gulfstream Park Oaks. She’s actually run worse than second only once in her career, but that came as a 10th-placing in the Pocahontas Stakes (G2) at Churchill Downs. The dark bay lass will have to do much better than that to factor on Friday under Jose Ortiz. Patrona Margarita captured the Pocahontas last year but has been well-beaten while finishing fourth in the Rachel Alexandra and Ashland behind Monomoy Girl in her two races since. Ricardo Santana Jr. has the call on the Calhoun trainee here. Heavenhasmynikki finished third while stretching out to a mile in the Davona Dale last out and might need more experience going a distance of ground before tackling these. Stakes winner Kelly’s Humor has been well-beaten by some in this field in the past. Her numbers are also a bit low compared to others in the Oaks and she could do better with an easier spot. Calvin Borel rides Heavenhasmynikki while Irad Ortiz Jr. pilots Kelly’s Humor.